Integra Boost Humidiccant uses patent pending technology that releases or absorbs moisture, maintaining relative humidity in a contained environment at or about 62% relative humidity. 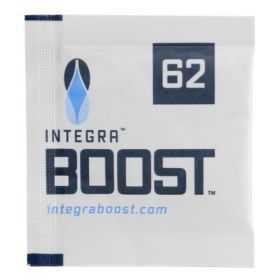 Each individually wrapped Integra Boost packet includes a replacement indicator card, when the round dot turns from pink to blue, its time to replace your Integra Boost pack. Available in 4 gram (2-1/4 in x 2 in x 1/8 in), 8 gram (2-3/4 in x 2-1/2 in x 1/8 in) or 67 gram (4 in x 6 in x 1/4 in) sizes.